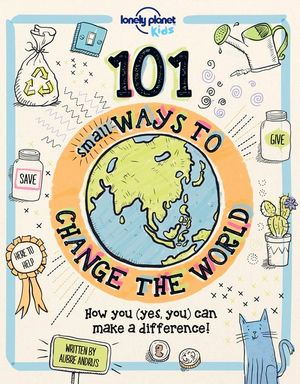 Children’s book author Aubre Andrus has come up with an easy-to-read book that has 101 ideas to make a difference to the world. She says that ideas start with one person and you don’t have to be big to make small changes that end up making a big difference. It’s the kind of book that you don’t have to read from cover to cover. Pick any activity to try … the important thing is to start somewhere. The section on caring for others includes activities as small as writing a thank you note which seems to be a long-forgotten courtesy. The caring for the planet section suggests simple things like turning off lights, saving water and crafty ideas for repurposing throw-away items. Then there’s a whole section on caring for yourself – as you are as important as the planet. Some of the challenges would be very empowering such as the exercise to say ‘yes’ to things in order to expand your world … and saying ‘no’ to over-committing yourself and realizing your limits. What about bringing ideas to school administration for whole-school action, writing to the local paper to raise awareness or even putting together an article on your ‘save the planet’ project? On a personal level, there are lessons for life about loving yourself, not holding grudges, celebrating the little things. Apart from reminding us to be healthy and challenge ourselves, this is a fantastic collection of so many small ideas could have large impacts. The 12 year-old in my life saw this book on my dining table and asked if she could read it when I was finished … and she’s not an avid reader! Although the book is probably written to appeal to upper primary and high school students, you’re never too old to put some of these suggestions into action to help contribute to a better world.